File photo dated 13-03-2018 - Ruby Walsh was taken to hospital for X-rays on a suspected broken leg following a heavy fall during the second race on day two of the Cheltenham Festival. Tim Goode/PA Wire. 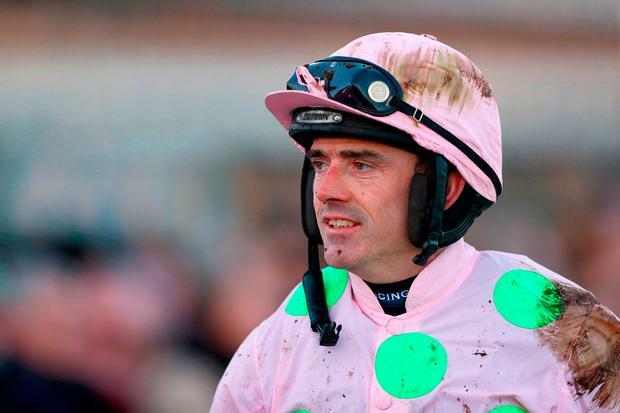 There can be few people who know more about the risk-reward nature of National Hunt racing than Ruby Walsh. Having returned to the saddle just six days ago after a lay-off caused by a broken leg suffered last November, Walsh enjoyed the sweet taste of success on the opening day of the Festival here yesterday, displaying once again his astonishing sense of timing when guiding Footpad and Benie Des Dieux to victory. His fall from Al Boum Photo at the second last fence in the RSA Chase, however, had an immediately ominous look to it, and Walsh was soon on his way to hospital for an x-ray that is expected to confirm that he has broken his right leg once again. Rich Ricci, whose Douvan Walsh was due to ride in the Champion Chase said: "It is unfortunate for Ruby and he is very much in our thoughts. We hope he is okay but it looks like a broken leg." Yesterday’s win in the Mares’ Hurdle aboard Benie Des Dieux had brought an emotional response from Cheltenham’s most successful jockey. Referring to his time on the sidelines, he said: "I have to pay tribute to (his wife) Gillian and the girls at home. While I was working to get back racing I was an average father and a horrible husband." And the roller coaster nature of racing was evident again almost immediately when Walsh’s absence from the Coal Cup field meant jockey changes which resulted in Mark Walsh getting his first Festival winner aboard Bleu Berry. When Walsh was recovering from his last leg break, he revealed that he had begun his calculations for a return while he was being taken from the ambulance. There is little doubt that he will be counting down the days once again after this latest setback, but the remaining races will be the poorer for the absence of the Festival’s most successful jockey.